Housefull franchise films have always been one of the most successful and loved films in Bollywood. Till now, three installments of this series have been released and now the audience should gear up for it’s fourth installment. Yes, the makers of ‘Housefull’ have announced the fouth part ‘Housefull 4’ and it will be releasing on Diwali 2019. The Interesting thing is that the fourth part will revolve around the theme of Reincarnation. After the success of it’s third part, which released last year, it was always on the cards that Housefull 4 will be announced soon. 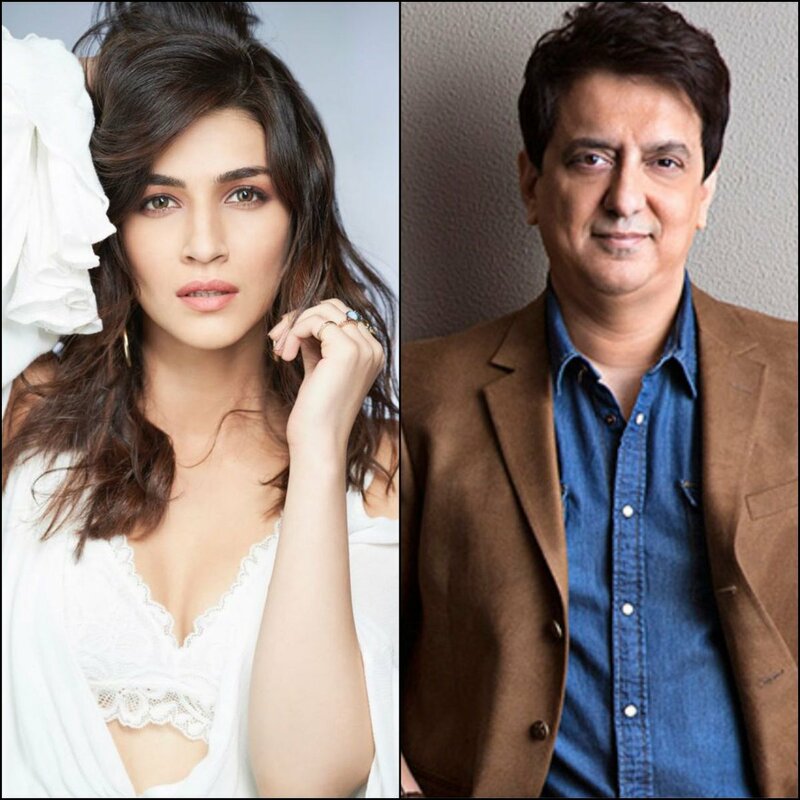 Well, that’s indeed happening and recently, the production house Nadiadwala Grandson have officially confirmed this news via their Twitter handle. “The #Housefull gang is back! 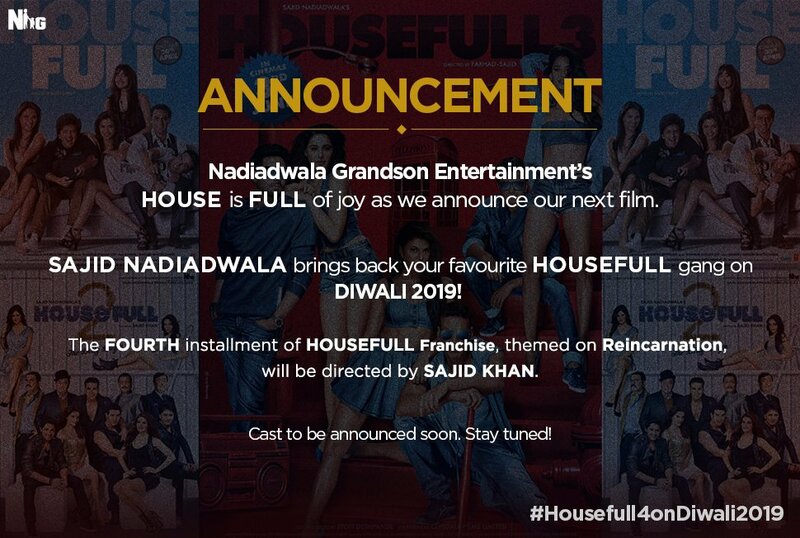 #SajidNadiadwala’s #Housefull4 arrives in #Diwali2019! @SimplySajidK @WardaNadiadwala #Housefull4onDiwali2019” they captioned. The film will be directed by Sajid Khan who helmed the first two installments of this comedy franchise. Housefull 3 was directed by Sajid-Farhad. Sajid Khan’s re-entry in the fouth part is really a good sign for the film. 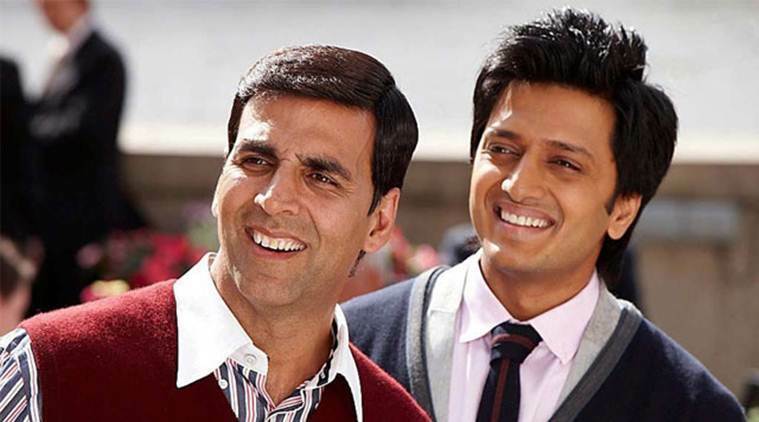 So far, Akshay Kumar and Riteish Deshmukh have appeared in all the ‘Housefull’ films, and the Akshay led gang is making its comeback, with some new additions to the cast this time. If the reports are anything to go by, the movie will be made on a lavish budget of around 180-200 cr which is very huge for a comedy film. The locations of the shoot will follow the same structure somewhat as before with international schedules included. London may well be the popular spot once again. Talking about the earlier movies, Housefull was released in 2010 and the movie featured Akshay Kumar, Riteish Deshmukh, Arjun Rampal, Lara Dutta, Deepika Padukone, Malaika Arora Khan, Boman Irani and Chunky Pandey in the key roles. Housefull 2, released in 2012, starred Akshay Kumar, Asin, John Abraham, Jacqueline Fernandez, Riteish Deshmukh, Shreyas Talpade, Zarine Khan, Boman Irani, Mithun Chakraborty, Randhir Kapoor and Rishi Kapoor. And finally Housefull 3 released in 2016 and starred Akshay Kumar, Abhishek Bachchan, Riteish Deshmukh, Jacqueline Fernandez, Lisa Haydon, Nargis Fakhri, Boman Irani and Aarav Chowdhary in the crucial roles.